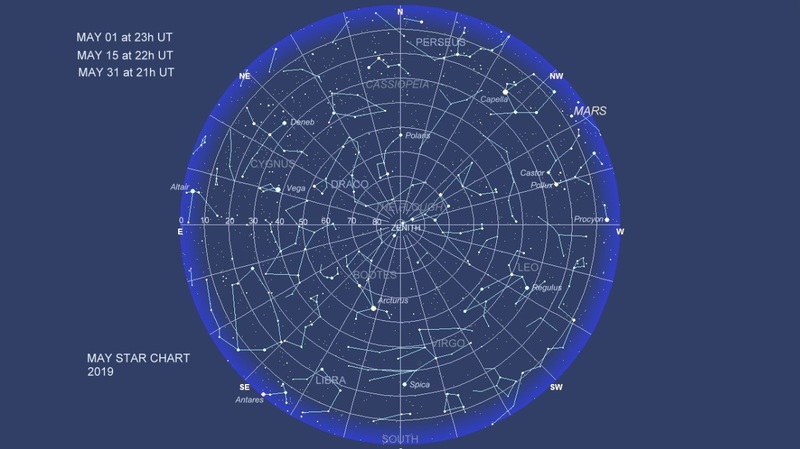 At the beginning of the month the Sun continues its journey through the constellation of Aries, until the 14th at around 19h00, when it crosses the astronomical border into Taurus. In the northern parts of the UK, twilight begins to persist all night, and there are no truly dark nights until the end of July. From now on, look out for Noctilucent Clouds, which are thought to be produced as a result of meteors passing through the upper atmosphere. These thin high clouds of ice crystals still catch the light of the sun, which even at midnight is not far below the northern horizon. Their appearance is that of silvery blue veils low in the northern sky, and may be seen an hour before and after midnight, often with interesting textures and patterns. The Moon is at perigee, the point of closest approach to Earth, at 22h00 on the 13th, and apogee, the furthest distance away from Earth as it can be, takes place at 13h00 on the 26th May. New Moon is on the 4th at 22h46. On this occasion, the Moon passes 6° south of the Sun on the Aries/Cetus border, passing 6° south of the Sun. First Quarter at 01h13 on the 12th takes place in the constellation of Leo, 5° to the upper left of Regulus (alpha Leonis) in the western sky. The Full Moon of the flowering meadows (Anglo Saxon, Maed Monath) is on the 18th at 21h12, when the Moon is in the eastern part of the constellation of Libra, just above the stars which represent the ‘head of the Scorpion’. Last Quarter Moon is on the 26th at 16h34 in Aquarius. From the 5th to the 10th look for earthshine on the night hemisphere of the waxing crescent Moon. Look again for this phenomenon at the time on the waning crescent, during the first four and last three days of the month. Venus rises at 04h00 on May 1st. The planet is moving from the constellation of Pisces into Aries. It is increasing in northern declination, and so by the end of the month rises earlier at 03h00. Look for it in the ENE sky. Mars moves from Taurus into Gemini and fades as the month progresses. On May 1st, its visual magnitude is +1.64, which is slightly fainter than Castor (alpha Geminorum). The planet sets in the evening sky at around 23h00 throughout the month, and so the period of availability for observation decreases considerably as evening twilight increases. The angular diameter of Mars has now shrunk to 4 secs of arc, and there is little chance of seeing any detail on its surface through a small telescope. The thin waxing crescent Moon lies to the south of Mars on the 7th between the horns of ‘The Bull’. The two are separated by 4°, and should be looked for in the NW on this evening; Mars lies to the north of the Moon. Jupiter lies in the constellation of Ophiuchus at a low southerly declination. At the beginning May it rises at 23h00, and at 21h00 by the month’s end. With the exception of Venus, Jupiter is the brightest planetary object in the night sky at visual magnitude (minus) -2.4. By the middle of the month the planet culminates at an angle of 14° in the south, as seen from Scarborough UK. The waning gibbous Moon may be seen some 4° to the east of Jupiter, as the two are rising, during the night of 20th in the SE quadrant of the sky. If you look through well focussed, firmly fixed binoculars, you will see the points of light, which are Jupiter’s Galilean satellites, slowly changing their positions on a nightly basis. Uranus, in western Aries, and Neptune in eastern Aquarius, are not suitably placed for observation during this month when twilight shortens the nights. If you look at the sky in the early morning of the 6th and the 7th from 02h, you may see an increase in the number of shooting stars visible, until morning twilight becomes too bright. Earth is crossing the path of Halley’s comet, and tiny particles, debris from this famous ‘dirty snowball’ hit the upper atmosphere as the Eta-Aquarid meteors. This meteor stream is best observed from the southern hemisphere. The radiant, from which the meteors appear to come, is such, together with the twilight at this time of the year that very few eta-Aquarids are likely to be seen at the latitude of Scarborough in the northern hemisphere. Constellations visible in the south around midnight, mid-month, are as follows: Libra, Scorpius, Serpens Caput (the serpent’s head) and Corona Borealis. Times are given in UT for SCARBOROUGH (0° 25' 0" W, 54° 16' 3" N, zone 0 UNIVERSAL TIME). 2019 05 28 22:55 Simultaneous transits on Jupiter: two satellites and shadow of one satellite.